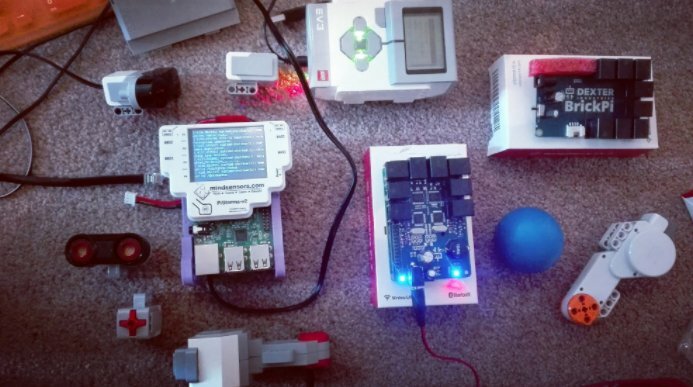 A project to learn Java and create software for Mindstorms Robots using hardware supported by EV3Dev & the LeJOS way. How to manage the hardware in an easy way? How to continue using Java with all boards? What happen with amazing LeJOS libraries about local-navigation in this context? The answer is this project, EV3Dev-lang-java. Note: At the moment, the whole solution is scalable until the next LEGO Mindstorms product estimated for next January of 2020. If you analyze the hardware, any EV3 Brick uses a SoC: Sitara Processor AM1808 (from year 2010) to manage Sensors & Actuators but now with the usage of a BrickPi/PiStorms unit, it is possible to use the power of a Raspberry Pi 3 increasing the possibilities to develop complex projects which require por Computational consumption. In 2015, EV3Dev was born to offer a solution to install a complete Linux Debian Operating System on EV3 Brick, BrickPi Series & PiStorms Series. The project provides an agnostic Linux interface to unify the way to interact with Mindstorms Hardware too. At the end of the same year, EV3Dev-lang-java was born with the idea to continue developing Java robots on Lego Mindstorms and providing a port of LeJOS libraries like the local-navigation stack. In the future, we will add the remote support and ROS support.